In the evenings, Charles Spurgeon’s wife would sit on a cushion at his feet and read to him. So far, I have been unsuccessful in persuading my wife to do the same for me, but I think I may have found an alternative solution. I now listen to Kindle books on iPhone. Wouldn’t it be great if you could squeeze in a few more chapters of your Kindle book while driving, exercising, or doing housework? Well, you can! 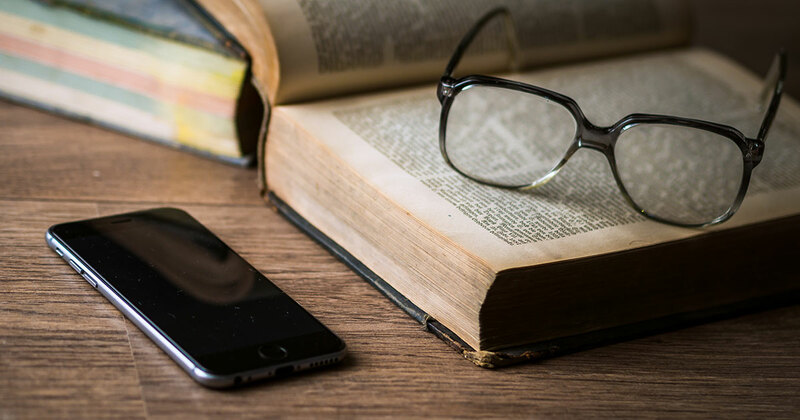 In this post, I am going to show you how to listen to Kindle books on iPhone. Certainly, audiobooks fill this need for hands-free reading to a degree. Between Audible and Christian Audio a decent offering of Christian books can be found. But Kindle’s selection is much more massive. And if you follow Tim Challies‘ blog (which you should), you likely have a prodigious selection of Kindle books you bought on sale for $2.99 but have never read. Plus, most new books release straight to Kindle at the same time the paperback comes out, but an audiobook (if it ever comes) shows up much later to the publishing party. Tragically, even in this era of e-books, we are still stuck reading most books with our eyes. Who will deliver us from this ocular tyranny? Enter: iPhone robot voice reading thingy. Did you know that your iPhone and iPad come with an accessibility feature that will read anything on the screen? It’s true. And it even has the ability to automatically turn the pages on your Kindle app! Here’s how to set it up so you can listen to Kindle books on your iPhone or iPad. Go to the app store. Search “Kindle” (it’s free), and download it. Open the app and login or create an Amazon account. Insanely, you cannot actually purchase Kindle books via the app (because Apple has a territorial spirit? ), but you can use the Safari app to do that, or just buy ’em using your computer. Open the Settings app—that’s the one with the gears…or are they sprockets? Cogs perhaps? Next, click General > Accessibility. Under the Speech menu, you can also select the voice you want to have read to you. I chose “Samantha (Enhanced)”. Don’t worry about selecting a speaking rate now, you can do this when you’re using the feature. Note: This means you will have to either remember to turn auto-lock back on when you aren’t using this feature, or get into the habit of turning your screen off manually. Step #4: Download and Open Calvin’s Institutes of the Christian Religion. Starting from the top of the screen, swipe down with two fingers. Suddenly you will hear a robot’s voice getting all theological on you. You will also see the speech controls pop up. Starting at the very top of the screen, swipe down with two fingers. You can adjust the rate of speech with tortoise or hare icons (the same guy who made your lawnmower developed this software). You can also pause or skip ahead. Once it starts reading the book, you will have controls for pause, play, skip-back, skip-ahead, as well as faster and slower reading rates. After a few seconds of playing, or if you click the little arrow on the top left of the controls overlay, the controls will minimize to the side. But you can get it back just by clicking the arrow again. Now You Can Listen to Kindle Books on iPhone! This is a really handy way to take in more books. But use your new power wisely. Here are a few tips to keep in mind to make the best use of this feature, and so that the robots do not become our overlords. You have to keep the screen on! I know… I know… But pray for the grace to accept this burden. This will, however, drain your battery. So, I like to turn the screen brightness waaaay down. You don’t need to see the screen to listen. Choose white text on black background, also to save battery. If you turn the screen off, the robot will finish the current page, then stop. Use bluetooth headphones if you’re on an iPad. Then you don’t have to carry it around with you. You can listen and process information faster than you can read. Science. So try working up to a faster listening speed—sorry, I mean a more rabbits listening speed. Only do this with lighter books. Like, don’t have a robot read the works of John Owen to you. Normal reading is still the best way to study heavier volumes. More information on Apple’s accessibility features. Any of the Kindle Fire tablets also do this using a more integrated text-to-speech setup for books that are enabled with that feature. If you want a cheap tablet that can read to you then you can pick up the low-end Kindle Fire for less than $50. I have been told that the Logos app for iOS can also utilize this speech feature, turn the pages automatically and that it will continue to work even with your screen turned off. Also, the standard iBooks app which ships with iOS works with the screen off as well. If I have a PDF I want to listen to, I usually send it to iBooks and have it read it to me there. So, check that out. I got it to work with Logos as well. The two finger down swipe was a little trickier, but it works. So helpful – thanks! Glad to hear it worked for you, DT. Thanks for the confirmation on the Logos side! I take it that you’ll eventually get use to the robotic sounding voice? You do. It takes a little while, but eventually you don’t really notice. But some words it pronounces really weird, especially Bible references. Gen 1:3 comes out as “General one hour and thirty minutes.” But even that you get used to. Just make sure you don’t start speaking that way yourself! I use the robot voice pretty regularly to do my school work, if you use Alex (voice) it is pretty easy to acclimate to. I don’t really notice it all that much anymore. If you have the room on you Ipad/Iphone or download the voice “Alex”. Alex is a little else robotic. I too got the voice to read from Logos. I use this feature with Logos as well. It seems to work better if you have you have the “scrolling feature” off. Also, at times I have experienced it skipping a head a few pages so it’s still helpful to keep your eye on the screen. Thanks for the tips, Matt. Does it keep playing even with the screen off in Logos? It seems to read Logos continuously even if the screen is turned off. It tends to repeat the last word on the “page” on the next page. Interesting. That’s really helpful to know. Thanks! Nice. My first task in seminary was to figure out how to get my Android to read to me so that I can listen while rowing at the gym. after freeing the ebook from the DRM using calibre (no guilt — I paid for the ebook) it’s pretty easy to copy .docx to Dropbox and from there export to @Voice aloud reader for android. I like the ivona beta TTS voice. She sounds lovely. This is how I read 90% of books. Thank you for sharing with others! Voice Dream app for iPhone is nice in combination with the free PC software Calibre. Calibre can be used for getting past the DRM text lock and then something like Dropbox can be used to bridge the content pass of unlocked ebook text between Calibre and the nice iPhone app Voice Dream. Thank you SO much for your tutorial regarding how to listen to Kindle books on iPhone! I love to read books using this method — thank you! Another helpful tip: If you are using earbuds with inline controls, you can use those controls to pause the Kindle book. First, open Spotify and play a playlist (some other music players may work?). With the music playing, go to the Kindle app and swipe down to active Speak Screen, this will pause the music. Now, when you hit the play/pause button on your earphones, the reading will pause and the music will resume playing. When you’re ready to continue reading, hit the play/pause button on your earbuds again and the music will pause and the Kindle book will continue where it had stopped! This is brilliant! I’m going to try it. This is a great article, but there’s one part I can’t figure out. I am unable to get Kindle to automatically turn the page. I’d love to use this feature to listen to books while driving, and touching my phone to keep turning the page won’t work. The “Speak Screen” works great, but since it doesn’t turn the page for me, it’s not extremely useful. Any tips on how to make this happen? Maybe I’m missing something easy/obvious? Thanks! Steve, did you make sure to leave the screen turned on and turn Auto Lock off? When the screen is off or falls asleep the pages stop flipping automatically.